OBJECTIVE: To determine the mortality rate and its predictors in patients with a presumptive diagnosis of tuberculous pericarditis in sub-Saharan Africa. DESIGN: Between 1 March 2004 and 31 October 2004, we enrolled 185 consecutive patients with presumed tuberculous pericarditis from 15 referral hospitals in Cameroon, Nigeria and South Africa, and observed them during the 6-month course of antituberculosis treatment for the major outcome of mortality. This was an observational study, with the diagnosis and management of each patient left at the discretion of the attending physician. Using Cox regression, we have assessed the effect of clinical and therapeutic characteristics (recorded at baseline) on mortality during follow-up. RESULTS: We obtained the vital status of 174 (94%) patients (median age 33; range 14 - 87 years). The overall mortality rate was 26%. Mortality was higher in patients who had clinical features of HIV infection than in those who did not (40% v. 17%, p=0.001). Independent predictors of death during follow-up were: (i) a proven non-tuberculosis final diagnosis (hazard ratio (HR) 5.35, 95% confidence interval (CI) 1.76 - 16.25), (ii) the presence of clinical signs of HIV infection (HR 2.28, CI 1.14 - 4.56), (iii) coexistent pulmonary tuberculosis (HR 2.33, CI 1.20 - 4.54), and (iv) older age (HR 1.02, CI 1.01 - 1.05). There was also a trend towards an increase in death rate in patients with haemodynamic instability (HR 1.80, CI 0.90 - 3.58) and a decrease in those who underwent pericardiocentesis (HR 0.34, CI 0.10 - 1.19). CONCLUSION: A presumptive diagnosis of tuberculous pericarditis is associated with a high mortality in sub-Saharan Africa. Attention to rapid aetiological diagnosis of pericardial effusion and treatment of concomitant HIV infection may reduce the high mortality associated with the disease. Tuberculous pericarditis is one of the most severe forms of extrapulmonary tuberculosis, causing death or disability in a substantial proportion of affected people.1,2 In Africa, the incidence of tuberculous pericarditis is rising as a result of the HIV epidemic.3 The effect of HIV infection on survival in patients with tuberculous pericarditis is unknown.2,4 Whereas some investigators have suggested that HIV-infected patients with tuberculous pericarditis have a similar outcome to non-infected cases,5 others have shown that there may be an increase in mortality in HIV associated with tuberculous pericarditis.2,6,7 We established a prospective observational study, the Investigation of the Management of Pericarditis in Africa (IMPI Africa) registry, to obtain current information on the diagnosis, management and outcome of patients with presumed tuberculous pericarditis living in sub-Saharan Africa, where the burden of HIV infection is the greatest in the world.4,8-10 In this paper, we report the mortality rate and its predictors during the 6 months of antituberculosis treatment among patients enrolled in the registry. The IMPI Africa registry was a multi-centre, prospective, cohort study of consecutive patients treated for tuberculous pericarditis in 15 referral hospitals in Cameroon, Nigeria and South Africa (SA). The design and conduct of the registry has been described in detail elsewhere.4 The study was approved by the Research Ethics Committee of the University of Cape Town, and all participants gave written informed consent. The participants were recruited between 1 March 2004 and 31 October 2004. Consecutive incident cases of suspected tuberculous pericarditis were recruited on commencement of antituberculosis treatment. Patients were eligible for enrolment if the attending physician felt sufficiently confident with the diagnosis of tuberculous pericarditis to commence antituberculosis treatment. The diagnosis and management of each patient was at the discretion of the attending physician in keeping with the observational nature of the study. The HIV status was based on the results of the serological test for HIV. However, at the time of the study, voluntary and confidential testing for HIV was not always offered in all medical institutions in Africa. We therefore requested the physicians to state whether they suspected HIV infection on clinical grounds and to classify each patient (on enrolment) as either having evidence of 'clinical HIV disease' or 'no clinical HIV disease' without regard to the HIV serological status of the patient. This assessment was left to the discretion of the collaborating physician, and no criteria were specified. This approach is consistent with usual clinical practice in Africa where, because of resource constraints, the diagnosis of tuberculous pericarditis is often made on clinical grounds,2 and clinical criteria for the assessment of HIV status are used in routine practice.11 No guidance on diagnosis and management was provided to the physicians because, as indicated earlier, one of the aims of the registry was to document contemporary practice regarding diagnosis and treatment of tuberculous pericarditis among physicians in various regions of sub-Saharan Africa. Clinical and therapeutic data on each patient were recorded on standardised case record forms - on enrolment and at 3 and 6 months following enrolment - and sent to the Project Co-ordinating Office at the University of Cape Town. Patient follow-up was carried out by personal interview, failing which telephonic enquiry and postal services were used. On enrolment, each patient nominated a person who could be contacted if the patient was unreachable at the time of follow-up. We also used the services of the South African Department of Home Affairs (for South African centres) and a private detective company to obtain the vital status of patients lost to follow-up. Study follow-up ended on 30 April 2005. Statistical analysis was conducted with the STATA 9.0 package (STATA Corporation, College Station, Texas). We used the Kaplan-Meier method to display the mortality rate, and the log-rank test to compare the survival distributions between patients with clinical features of HIV infection (or 'clinical HIV disease') and those without. Cox proportional hazards regression was used to determine which pre-defined characteristics (i.e. age, gender, clinical HIV disease, serologically confirmed HIV infection, pulmonary tuberculosis, abnormal electrocardiogram, haemodynamic instability, New York Heart Association (NYHA) functional impairment, alternative diagnosis, pericardiocentesis, adjunctive steroid use, geographical region, and antiretroviral drug use) were associated with mortality. Clinical HIV disease and serological HIV infection were fitted into separate multivariate regression models. We grouped the 15 participating hospitals into 6 geographical regions, viz. Eastern Cape (SA), Gauteng (SA), KwaZulu-Natal (SA), Western Cape (SA), Yaoundé (Cameroon), and Ibadan (Nigeria). Geographical region was fitted into the multivariate regression model as an explanatory variable, with Eastern Cape (SA) as the reference group (i.e. the region that contributed the largest number of patients to the study). The data reported are medians (ranges), absolute counts (percentages), and hazard ratios (HR) with 95% confidence intervals (CI). Significance tests were two-tailed, and statistical significance was defined at the 5% alpha level. We obtained complete survival information for 174 of the 185 (i.e. 94%) enrolled participants, whose characteristics are shown in Table I. The 11 patients (6%) who did not come for follow-up visits and for whom we could not obtain information on vital status (at 6 months from enrolment) were from Ibadan (N=1), the Western Cape (N=1), Guateng (N=2), KwaZulu-Natal (N=3), and the Eastern Cape (N=4). The median age of the 174 patients with complete information was 33 years (range 14 - 87 years), 57% were men, and 39% had clinical HIV disease. Ninety-six (52%) patients had a serological test for HIV infection, and 53 of these (55%) were found to be HIV positive. There was strong agreement between clinical signs of HIV disease and serological HIV status, which confirms the validity of the clinical assessment of HIV status in this study.4,11 The sensitivity of clinical signs of HIV disease was 76% (40/53) and the specificity 88% (38/43). One hundred and sixty-eight (97%) had definite or probable tuberculous pericarditis, according to the criteria of Mayosi et al.2 All patients were commenced on antituberculosis chemotherapy, and 102 (59%) received adjunctive oral corticosteroids. At baseline, 7 of 53 (13%) patients with serologically confirmed HIV infection were on antiretroviral drugs, and by 6 months the number had risen to 10 (19%). Six patients (3%) had a proven non-tuberculosis cause for pericarditis (i.e. malignancy, 2; purulent pericarditis, 2; nephrotic syndrome, 1; systemic lupus erythematosus, 1). Overall, the 174 patients with complete follow-up information were representative of the 185 enrolled in the study (Table I). The overall mortality rate at 6 months was 26%; 40% in patients with clinical HIV disease and 17% in those without (p=0.001). 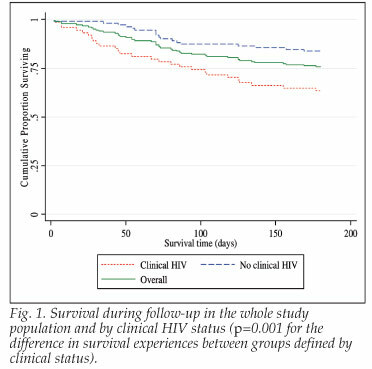 The Kaplan-Meier survival distributions for patients with and without clinical HIV disease show that at any point during follow-up, patients with clinical signs of HIV infection had a significantly higher mortality rate than those without clinical evidence of HIV disease (crude log rank Χ2=10.72; df=1; p=0.001) (Fig. 1). Univariate Cox proportional hazards regression analyses identified age (p=0.019), clinical HIV disease (p=0.002), pulmonary tuberculosis (p=0.009), a proven non-tuberculosis cause of pericarditis (p=0.007), use of antiretroviral drugs (p=0.003), and residence in Yaoundé, Cameroon (p<0.001) to be significantly associated with a higher mortality rate during follow-up (Table II). The results remained unchanged when the univariate analyses was repeated, controlling for age. In addition, there was a marginally significant increase in death rate among patients who presented with dyspnoea (p=0.079) and haemodynamic instability (p=0.094), and a decrease in those who received adjunctive steroids (p=0.058). 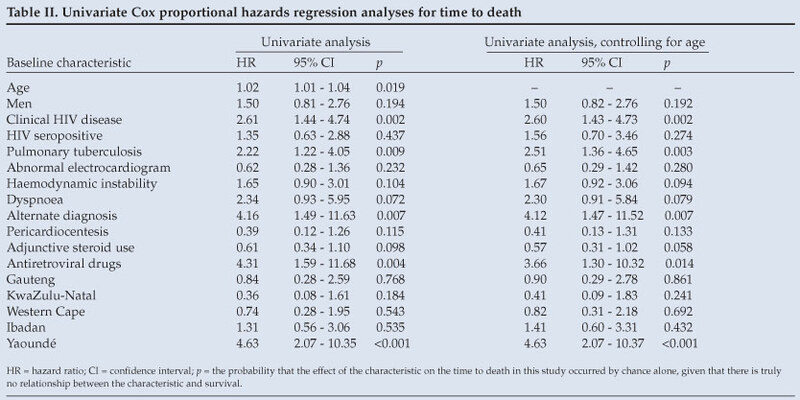 In the multivariate Cox regression model, the independent predictors of mortality (Table III) were a proven non-tuberculosis diagnosis (HR 5.35, 95% CI 1.76 - 16.25), presence of clinical features of HIV infection (HR 2.28, 95% CI 1.14- 4.56), pulmonary tuberculosis (HR 2.33, 95% CI 1.20 - 4.54), and increasing age (HR 1.02, 95% CI 1.01 - 1.05). There was also a trend towards an increase in mortality in patients with haemodynamic instability (HR 1.80, CI 0.90 - 3.58) and a decrease in those who underwent pericardiocentesis (HR 0.34, CI 0.10 - 1.19). When we excluded the 6 patients with a non-tuberculous cause of pericarditis, the results remained unchanged. We found, in the first multi-centre study of mortality in pericardial disease, that 26% of patients with presumed pericardial tuberculosis die within 6 months of diagnosis, despite antituberculosis therapy. Clinically evident HIV infection had a major impact on the death rate, raising it from 17% in patients without clinical features of HIV infection to 40% in those with overt HIV disease. Other predictors of mortality were a non-tuberculous cause of pericarditis, pulmonary tuberculosis (a marker of disseminated disease), and, as expected, increasing age. The introduction of antituberculosis chemotherapy resulted in dramatic reduction in mortality from tuberculous pericarditis from 80% in the 1950s to 8% by the 1980s.2,12 The extremely high 6-month all-cause mortality in this cohort of relatively young patients (median age 33 years) is approximately equivalent to the 10-year all-cause mortality reported in patients with pericardial effusion in the only large survival study of tuberculous pericarditis reported from pre-HIV Africa.13 Bearing in mind the impact of age on mortality, the difference is even more striking, given that the median age of patients in the 10-year series13 was more than a decade older than those of our patients. The dramatic deterioration in outcome of patients with suspected tuberculous pericarditis that we observed has been associated with the advent of the HIV epidemic. We have previously shown that patients with suspected tuberculous pericarditis and HIV infection have greater myocardial involvement, dyspnoea and haemodynamic instability.4 There was a trend towards an independent association between these factors and mortality in multivariate analysis, which did not attain statistical significance, and it is likely that these factors are markers of severe cardiac disease which would be expected to have a negative effect on mortality. However, the hazard ratios for these factors had wide confidence intervals, and it is possible that our study did not have adequate statistical power to detect an effect of the magnitude observed. The 12-month mortality of HIV-seropositive patients with extrapulmonary tuberculosis is 22 - 25%, which suggests that the mortality rate of 40% at 6 months in people with clinical overt HIV disease is exceptionally high.14 It is of interest that the use of adjunctive oral corticosteroids in 59% of the participants4 (a controversial intervention in this condition6,15,16) did not have a significant independent effect on survival in this observational study. The use of steroids in the IMPI Africa registry, however, was not randomly allocated, and the study may lack sufficient statistical power to detect an effect-size of the magnitude found (i.e. relative reduction in mortality rate of 39% within 6 months of diagnosis), which justifies the need for an adequately powered randomised controlled trial to assess the effect of steroids in tuberculous pericarditis. There was a trend towards a higher mortality among patients from Yaoundé, Cameroon, which disappeared in the multivariate model. This trend could be due to a number of reasons. Firstly, the participants recruited in Cameroon had the highest rate of clinical HIV disease and disseminated tuberculosis.4 In addition, there could have been differences between the care of patients in different countries, including implementation of the directly observed treatment - short-course (DOTS) strategy17 and use of cotrimoxazole prophylaxis in HIV-coinfected patients, which we did not document in the registry. 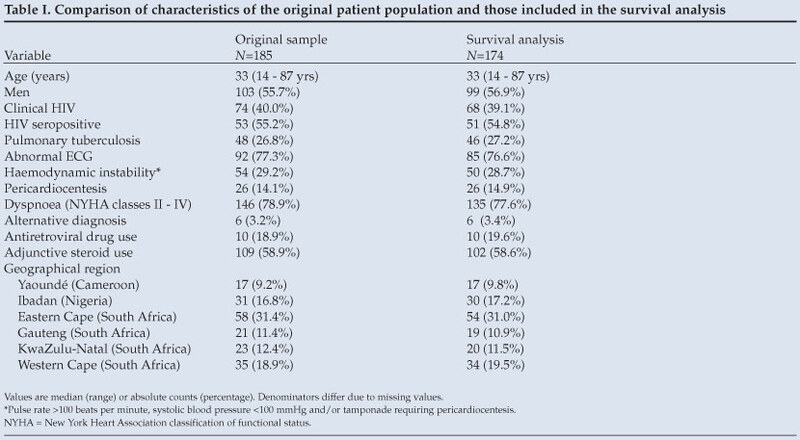 This study has several limitations.4 Definite diagnosis of tuberculous pericarditis was established in only 13 patients, with 166 participants having probable tuberculous pericarditis.2,4 The absence of confirmation of the diagnosis of pericardial tuberculosis is a major weakness of this study, as the mortality was particularly high among patients who had an alternative diagnosis. Similarly, serological confirmation of HIV infection was available in 96 of the 185 patients (52%). Among these patients, the clinical diagnosis of HIV infection was incorrect in 18 patients.4 However, ours was a real-life study which reflects the economic circumstances of medical practice in many African countries characterised by frequent shortages that, in this study, precluded HIV serological testing and microbiological confirmation of tuberculosis in a large proportion of the participants. The findings of this study have several implications for clinical practice and research. The high short-term mortality and the significant association between mortality and an alternative diagnosis provide an important impetus for an aetiological diagnosis to be made whenever possible in patients with suspected tuberculous pericarditis, rather than empiric introduction of antituberculosis therapy.2 In addition to the necessity for the improvement of the specific diagnosis of the disease, there is also an urgent need for research on the appropriate timing of the introduction of antiretroviral therapy, and the identification of effective adjunctive treatments to reduce the high mortality associated with tuberculous pericarditis. - Study Coordinator, MN, FG, JV, GM and PJC) designed the study, and co-ordinated data collection, analyses and interpretation. The IMPI Africa Steering Committee (BMM - Chair, CSW - Secretary, MN, AA, BMT, BT, KNB, KR, KS and BGB) supervised all aspects of the study. CSW wrote the first draft of the manuscript, and all authors contributed intellectually to, and read and approved, the final manuscript. The IMPI Africa Registry was sponsored by the South African Medical Research Council and National Research Foundation (through the 2004 - 2006 Africa Fellowship to Dr C S Wiysonge); the University of Cape Town's Cardiac Clinic Research Fund; and the MESAB (Medical Education for South African Blacks) (through the 2003 Don Kennedy Scholarship to Dr M Ntsekhe). The study was conducted independently of the funding organisations.